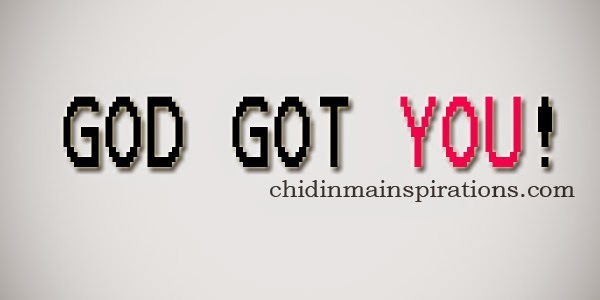 Chidinma Inspirations: God Got You! Many atimes, we try to help God figure things out. Many atimes, we try to help God perform His job. Many atimes, we try to assume this is what God has in stock or in mind for us. Many atimes, we try to assume, that this is how God has set to work things out. But one thing we fail to always understand is that, God is a mystery. His ways are mysteries before man. God is not man. He doesn’t act the way we think. If God acts the way we want Him to act then where is the God factor in His actions? No one can help God do what He alone knows how to do. No one can figure out what God intends to do. Yes, we all know that God thoughts for us are thoughts of good and not of evil to give us an expected end. But how God will give us that expected end we desire, His left for Him to work things out His way and in His time, not us trying to figure His ways and plans for Him. Many atimes, when we try to help God figure things out for Him, when we try to assume that this is exactly how God is working, we fail to understand that we are using our own human wisdom. This leads us to start depending and relying on our own human understanding and on man. This leads us to start putting our trust in man. The sad truth is, the moment we start to trust man or the moment we start to depend on man, we start dying. We start getting one disappointment here and there. God doesn’t need you and I to do His job of being God and do what He alone know how to do. God works when we least expected. God uses the person you and I least expected to grant us our desires. God is not and will never be an author of confusion. When something is from God, there is no two ways about it; there is just this unexplainable peace you will have inside. Remember, God’s blessings have no sorrow in it (Proverbs 10:22). God has seen tomorrow even before tomorrow came. God has gone into your tomorrow and knows the best and right time to give you that thing that you desire from Him. He has seen the obstacles and the stumbling blocks in your tomorrow and is working tirelessly to see that those obstacles and stumbling blocks are completely removed, so that when He gives you your heart desire, you won’t say God’s blessings are causing you sorrow. God has you in mind 200% of the time. Why do you think you sleep and God doesn't? Because, you were created to rest and for God to do the work that there is to be done. Because you were created to be happy and let God do the worrying. So anytime you stay up late thinking of how certain things will get done, you are only limiting God’s power and work (Matthew 6:25-34), (Matthew 11:28-30) & (Luke 12:25). Relax God got you. Your heart desires will ALWAYS come to pass. God will make sure it does. But you have to trust God completely. It’s never easy but it is always worth it. Always Know That God Got You! I hope you were inspired? Please kindly share with others to inspire them too. I am glad you were inspired dear Anthonia.